The biggest take-home message from this week’s superannuation changes by the government is that the Coalition can never be trusted on superannuation. Its leaders say one thing and do another, trying to out-Labor the ALP when it comes to imposing higher taxes on savers who are seeking to provide for their retirement. And how should we interpret the government’s backflip on the crazy backdated lifetime post-tax super cap? During the election campaign, Malcolm Turnbull was adamant: “I’ve made it clear there will no changes to the (superannuation) policy. It’s set out in the budget and that is the government’s policy.” I guess that was then. 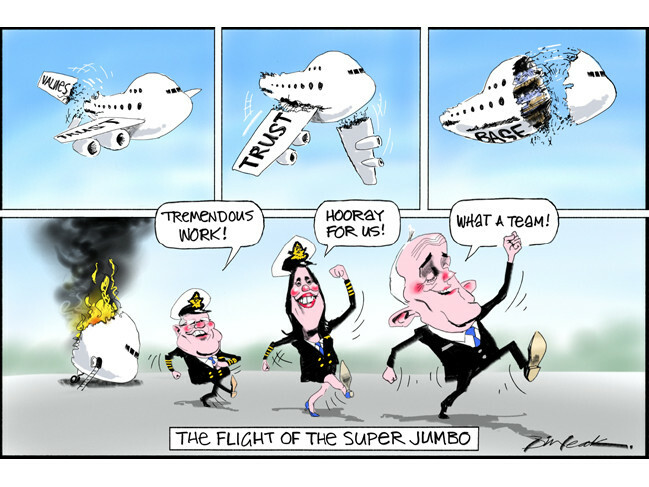 What a complete fiasco the superannuation saga has been. Mind you, Scott Morrison and Revenue and Financial Services Minister Kelly O’Dwyer have only themselves to blame. They were hoodwinked by extraordinarily complex and misleading advice given by deeply conflicted bureaucrats. The only conclusion is that they are just not that smart. How do I know this? Because Treasury has been trying to convince treasurers for years that these sorts of changes must be made to the tax concessions that apply to superannuation. Mind you, these concessions apply because superannuation is a long-term arrangement in which assets are locked away until preservation age is reached. It was only when the Treasurer and O’Dwyer took on their exalted positions that Treasury was able to execute its sting. Other treasurers (even Wayne Swan) had the wit to reject Treasury’s shonky advice. But here’s the bit of the story I particularly like: when it came to the proposal that those pampered pooches (the advising bureaucrats) should pay a small amount of extra tax on their extraordinarily generous and guaranteed defined benefit pensions (the 10 percentage point tax rebate will cut out at retirement incomes above $100,000 a year), they baulked at the idea. This is notwithstanding the fact they have been members of funds that have paid no taxes during their careers and they will have also built up substantial accumulation balances on extremely concessional terms. Clearly, no one in Treasury has heard of the rule that what’s good for the goose is good for the gander. Let us not forget that the superannuation changes announced in the budget represent a colossal broken promise by the Coalition government not to change the taxation of superannuation, a promise reiterated on many occasions by Morrison when he became Treasurer. When you think of all the criticism Tony Abbott faced, including from the media, about his broken promises on (supposed) cuts to health, education and the ABC — actually the growth of spending in these areas was merely trimmed — it is extraordinary that there has not been the same focus on this unequivocally broken promise of the Turnbull government. To be frank, I am not getting too excited about the government’s decision to scrap the loony idea of having a backdated post-tax lifetime contribution cap. It was never going to fly. The fact David Whiteley, representing the union industry super funds, is endorsing the tweaked super package is surely bad news for the government. He has declared “this measure, combined with the rest of the proposed super reforms, will help rebalance unsustainable tax breaks and redirect greater support to lower-paid workers who need the most help to save for retirement”. Actually, the government does the saving for these workers by guaranteeing them a lifetime indexed age pension. It is the middle (and above) paid workers who need the most help to save for retirement. It will also be interesting to see Whiteley’s stance when O’Dwyer seeks to push through changes to the governance of industry super funds and default funds. Here’s a tip, Kelly: he won’t be your friend then. My bet is that O’Dwyer will lose again on this front. In terms of the replacement of the lifetime non-concessional cap, the government’s alternative is extremely complex and potentially as restrictive. Post-tax contributions will be limited to $100,000 a year (they can be averaged across three years), but only for those with superannuation balances under $1.6 million. The fact the market value of these balances fluctuates on a daily basis makes this policy difficult to enforce. Is the relevant valuation when the contribution is made or at the end of the financial year? And what about the person who is nearly 65 and is barred from making any further contribution, but the market drops significantly after their birthday? O’Dwyer’s response no doubt would be: stiff cheddar, egged on by her protected mates in Treasury who bear no market risk at all when they retire. What the government is clearly hoping to achieve is that, in the future, no one will be able to accumulate more than $1.6m as a final superannuation balance. At the going rate of return that retired members can earn on their bal­ances without taking on excess risk, the certain outcome is that there will be more people dependent on the Age Pension in the future. But Morrison and O’Dwyer will be long gone by then. There is also a deep paternalism underpinning this policy. An income slightly north of the Age Pension is sufficient for old people, according to Morrison and O’Dwyer. After all, Morrison had no trouble describing people with large superannuation balances as “high income tax minimisers”. We obviously should have been more alert to the possibility of the Turnbull government breaking its solemn promise not to change the taxation of superannuation. Last year, O’Dwyer described superannuation tax concessions as a “gift” given by the government. I thought at first she must have been joking. But, sadly, her view of the world is that everything belongs to the government and anything that individuals are allowed to keep should be regarded as a gift — the standard Treasury line these days. The final outcome will be a policy dog’s breakfast that carries extremely high transaction costs and delivers little additional revenue for the government. Superannuation tax revenue has disappointed on the downside for years and there is no reason to expect this to change. But by dropping just one ill-judged part of the policy, the government thinks it can get away with pushing through the rest of it. The dopey backbenchers clearly have been duped into accepting it, even those new members who maintained a commitment to lower taxation and small government before they were elected. It’s a bit like a real estate agent who shows you four atrocious houses. The fifth house is slightly better and you take it. The reality is that the fifth house is also dreadful but you have been tricked into accepting it on the basis of the contrived comparison. There are still major flaws in the government’s policy. If there is an overall tax-free super cap, why have any limits on post-tax contributions at all? The figure of $1.6m is too low. And the indexation of this cap should be based on wages, not the consumer price index. The changes to transition-to-retirement should be dropped and the concessional contributions cap raised to $30,000 a year, at least, for those aged 50 and older. But I’m not holding my breath. When Morrison said the government had “no interest in increasing taxes on superannuation either now or in the future”, he told an untruth. Just watch out for more revenue grabs in the future.